Occasionally, even the best roofs spring a leak. Most of the time, these leaks are minor. While minor leaks still need to fixed as soon as possible, they are not emergencies. Major leaks, however, can cause serious damage very quickly. The wooden frame under the roof is very susceptible to water damage. 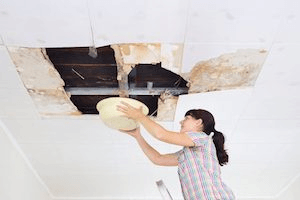 An emergency roof leak must be repaired immediately. If you do not fix the leak, the repairs will likely be extremely expensive. The situation may even become dangerous. Severely damaged roofs can collapse. This will require a roof replacement, and may even injure anybody inside. For more information on what to do when your flat roof has a severe leak, read on. Many people who have an emergency roof leak try to fix it themselves. This is usually not a good idea, even if the leak is minor. Roof repair is more complicated than most people think. Unless you are very handy, you shouldn’t even try to fix a small leak. Attempting to fix a large leak may be dangerous. Even if you do not fall off the roof and injure yourself, it is unlikely that you will effectively fix the leak. When you have assessed the situation and determined that you need to call a roofing company, you have to figure out which roofing company to call. There are several important factors to keep in mind when you’re making this decision. Firstly, you want to hire a roofing company that specializes in the type of roof you have. Carolina Flat Roofing, for example, specializes in flat roofs. It is also important to hire a company that is known in the community as a reputable firm. You can check online review sites, but sometimes these sites can be misleading. Check with your friends and family and learn about good roofing companies by word of mouth. Once you have figured out which company to call, don’t hesitate. Time is of the essence when you are dealing with a serious leak. If you have an emergency roof leak or any roofing issues, check out our website. We are happy to answer any questions you might have. Our customers are very important to us, and we make a point of establishing a personal relationship with every single one of them. We have been established and respected in our community as flat roof specialists for many years, and we would love the opportunity to work on your house.